Privacy Program Management: Tools for Managing Privacy Within Your Organization provides the critical tools necessary for anyone responsible for managing privacy program governance and operations within their organization to establish a privacy program and maintain it across all states of its operational life cycle. This valuable text covers creating a company vision, structuring the privacy team, developing and implementing a privacy program framework, communicating to stakeholders, performance measurement and the privacy program operational life cycle. 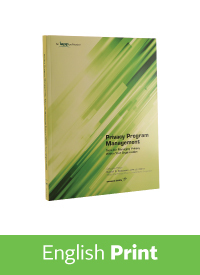 Privacy Program Management is an indispensable resource and this comprehensive how-to guide also serves as the principle text for the Certified Information Privacy Manager (CIPM) program—the first global certification in privacy program management. Bulk discounts are available. For details, contact membership@iapp.org. Print version included FREE when you register for the Privacy Program Management live training. Electronic version included FREE when you register for the Privacy Program Management online course. For Official Training Partner courses, please reference the training resources included in your Official Training Partner course bundle. In addition to print, this product is available in electronic format.